Heart-rending story of a legendary athlete. “Unable to bear the acute hunger, I had to eat mud and my mother silently watched the horror with tears rolling down her eyes,” related the athlete O.P. Jaisha about her early life. Her father met with an accident that left him bedridden. Her mother was a sensitive lady unequipped to bring up three daughters. Their only source of income was one cow. From a life riddled with dificulties, Jaisha heroically succeeded aainst all odds. Her dedication, devotion and determination can be gauged from the fact that with just 3 months training she participated in Mumbai Marathon and not only won the race in2:37:29but also broke the 20 year old record on her debut. Completing the grueling 42 KM race itself is a stupendous task and breaking a 2 decade record is unprecedented in the annals of the athletic history of the world. In the recently conclude National Games, she won gold in 100,00 Meters in a record time of 33 minutes and 8.55 seconds. She finished far ahead of her competitors and even the second placed athlete was more than one lap behind her. She also won the 5,000 meters race comfortably. Jaisha won several medals at National/ International competitions including Asian Games, Asian Athletic Championship and Commonwealth Games. Unfortunately such incredible achievements did not get the desired publicity where as much lesser achievements of other sportsmen are prominently published in all medias. She is a golden girl with nerves of steel. Her performance is unparalled, incredible, unprecedented and amazing. She is our best bet for an Olympic Medal as she has the potential to improve tremendously. She is arguably the best athlete India has produced after P.T. Usha. If you require, I can provide further details. NB: I wrote to about 80 eminent organisations/individuals (Most of them in the 500 rich person of the country) soliciting support. Except few acknowledgements, I could not get any positive response. The poor girl has to spend money from her feeble pocket to buy even shoes. After all she is not running for the country and for upholding the prestige of the nation. I can give further details if you desire. Legends are born once in a blue moon and we should not allow slipping this opportunity. History will not forgive us for this lapse. There is not an iota of doubt that given the best training, best diet and much needed international exposure, she will make her career best performance in the future sports meets and take the country to the pinnacles of glory. 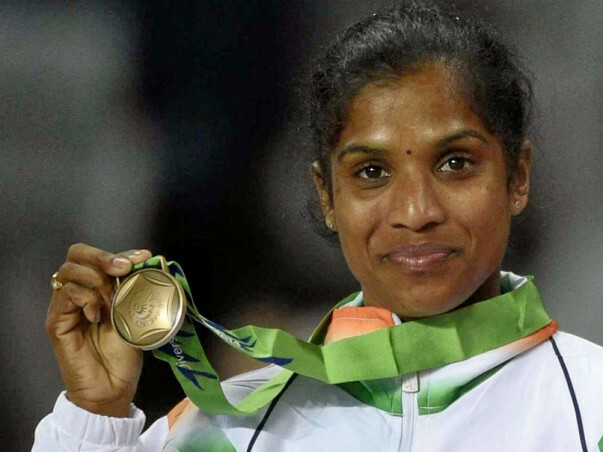 Let us fervently hope that she will soon get a sponsor to fulfill the great Indian dream of winning an athletic medal at the Olympics which was narrowly missed by Milkha Singh and P T Usha.